Dear Readers, after two weeks in Austria I am back in an over-heated, parched London and find myself yearning for the fresh breezes of the Alps. 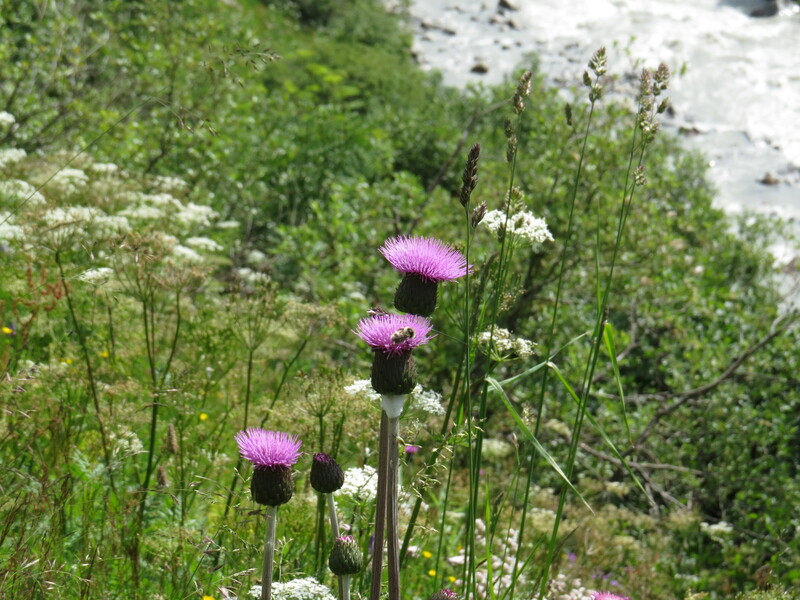 So what better to do than to write about one of my favourite plants, the melancholy thistle (Cirsium heterophyllum)? It is true that this is not a southern plant in the UK, preferring the uplands of northern England (where it is known as the shaving-brush plant) and Scotland, but I have occasionally seen it in wildlife gardens in the Capital. Generally, it is found in cold and mountainous areas of Europe and Western Asia, and with its big, solitary flowerheads it is one of the highlights of an Alpine meadow. No sooner has it come into bloom than it is descended upon by bees, butterflies and flower beetles, who seem to swoon into its cerise embrace. “the decoction of the thistle in wine being drank, expels superfluous melancholy out of the body, and makes a man as merry as a cricket; … my opinion is, that it is the best remedy against all melancholy diseases”. It maketh the finches as happy as crickets in the autumn too, as they love the seeds. Plus, melancholy thistle has no spines. When I think back to those banks of flowers in Obergurgl, it fills me with a kind of joy that, every year, I have been there just at the right time to see the buds opening, and the creatures coming to feast. 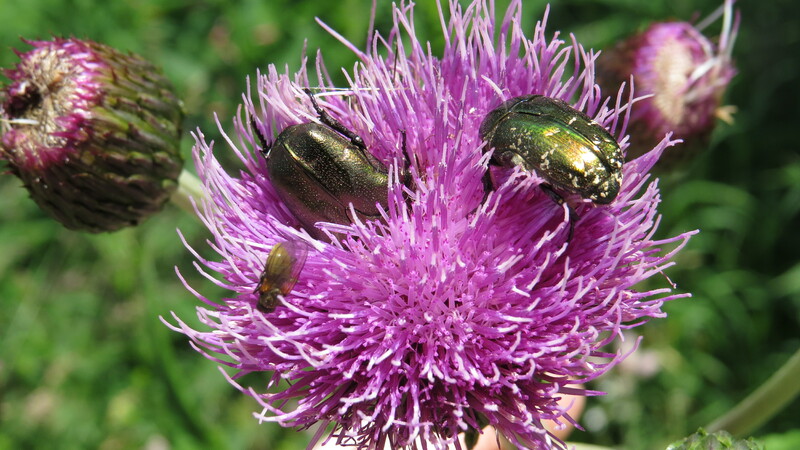 As I’ve grown older I’ve changed from wanting to skim the surface of a wide range of places to wanting to know them deeply, and it does my heart good to know where I might find the rose chafers, and the secret places where the fritillaries come to feed. My Dad used to be a distiller of Gordon’s and Tanqueray gin, and he is very unimpressed by the current trend for fancy flavours. Nonetheless I am much intrigued by such concoctions, although at 43% proof a bottle would last me a very, very long time. 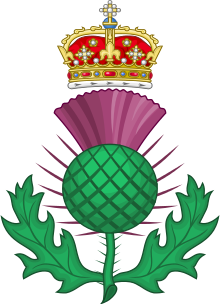 I have been considering which poem to use for this plant, and naturally many of them are Scottish – after all, the thistle is the symbol of that fine country. However, the question is, which thistle? 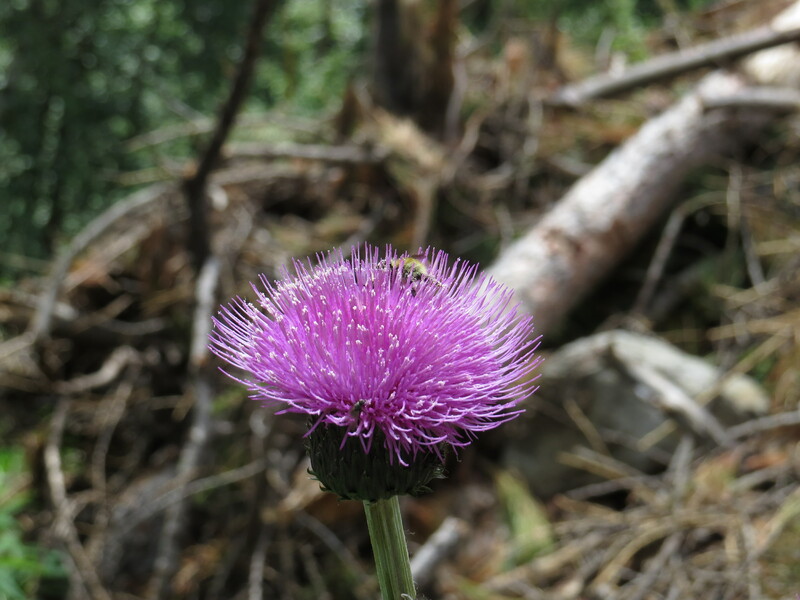 While the melancholy thistle has the magnificent flower that we might expect, it is, as already noted, without thorns, and surely part of the symbolism of the Scottish thistle is that it is not to be trifled with. I have therefore, with regret, set Hugh MacDiarmid’s ‘A Drunk Man Looks at the Thistle’, and several works by Robert Burns, to one side, as I believe that they refer to the much feistier Spear Thistle. However Ted Hughes, always a close of observer of nature, wrote a poem about thistles that somewhat hits the spot. I suspect that even this is about a rather spikier thistle than the gentle Cirsium heterophyllum, but it is much too hot here in London to be particular. How martial Ted Hughes sometimes seems! In so many of his poems, nature seems to be about nothing but scrapping and fighting. There is a lot of this, of course, but there is also a lot of co-operation and harmony. 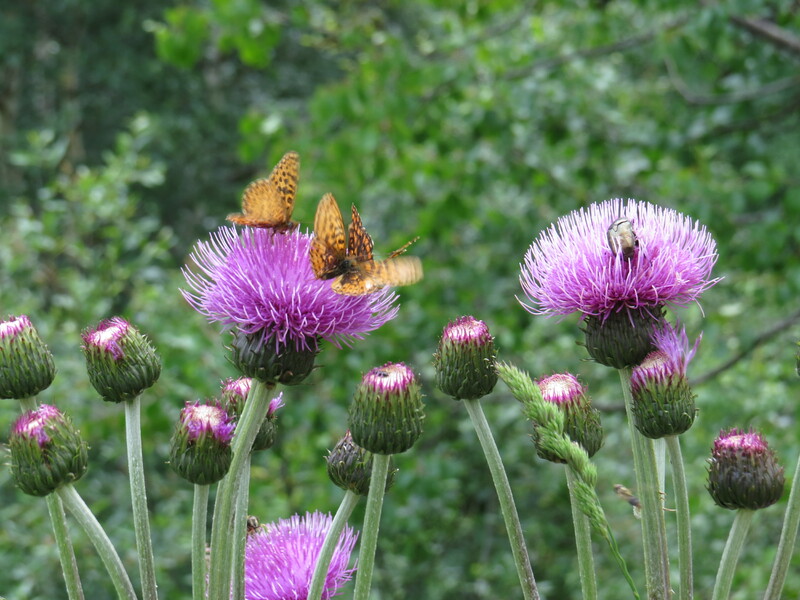 I prefer to think of the way that the melancholy thistles open to the fumblings of bees and beetles as being of benefit to both the insects and the plant, but Hughes is much keener on conflict. Ah well. Both our views are true, and they are not mutually exclusive. But just as Western society seems to see tragedy as more ‘real-world’ and more important than comedy, so the gentler aspects of life do not seem as worthy of celebration. I sometimes wonder how the concentration of the arts and media on conflict and destruction skews our psyches, and affects our view of the world. And so, as a balance to the view of nature as ‘red in tooth and claw’, here is one of my very favourite poems, which doesn’t mention thistles at all, but which somehow accords with my current mood. I am not a creationist, so in answer to the question ‘ Who made the world’ I would answer ‘ a complex interaction between forces’, but the close attention to the grasshopper, and the plea to be in the moment both appeal to me very much. This entry was posted in Bugwoman on Location on July 18, 2018 by Bug Woman. I love thistles and Mary Oliver : ) Happy summer! Gads! It looks too much like the nasty weed thistles! But then, it looks like a blooming artichoke too. I tried to grow artichokes in the garden, for the butterflies and bees rather than for me, but they were most unhappy – maybe the clay soil and the north-facing aspect did them in. 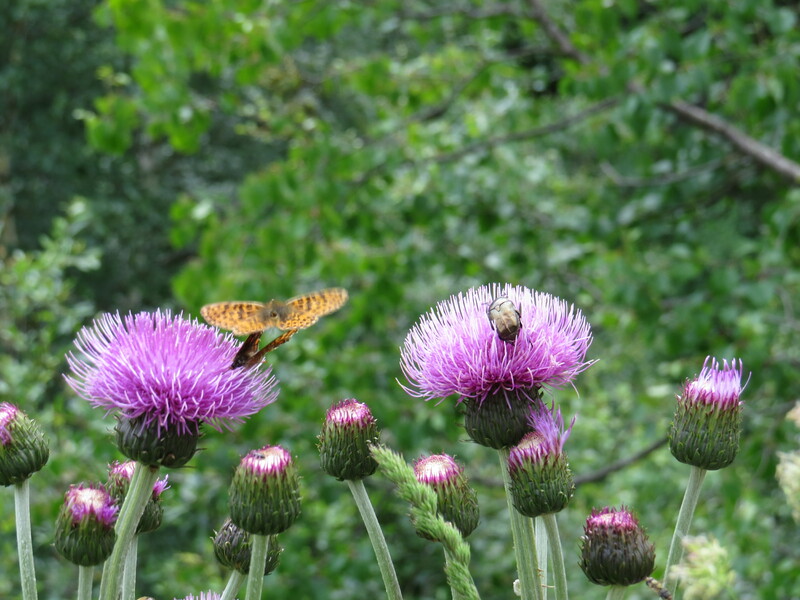 Most thistles love the sun, eh…. Artichoke certainly likes to be exposed. I do not think that it minds dense soil, as long as it is not watered so much that the soil is always muddy. The soil of Castroville is somewhat dense. Artichoke used to grow near the San Francisco Bay north of Santa Clara too. The soil is quite dense there. Because of the abundance of nectar it’s lovely to see the different creatures that Thistles attract, only yesterday we took a photo of a Small Skipper and a Cinnabar moth sharing the same Thistle head. Hoping that you’re dad is improving, we’ve kept you in our thoughts this week. Thank you, Fran and Bobby….it’s an evolving story, for sure! Yep, I am still curious about the plant, so send me the base if you get a minute? No rush, but I do like solving mysteries…. Oh, I love that Thistle, it looks so perfectly ‘of itself’. The colour is a favourite too and the idea that it could raise my spirits if taken with wine is an added sop. Thank you, teacher for another lesson. I love melancholy thistle with a passion, particularly the way that the bees seem to swoon into it as if it was a feather bed….